This ring was modeled after a 1930’s style engagement ring. 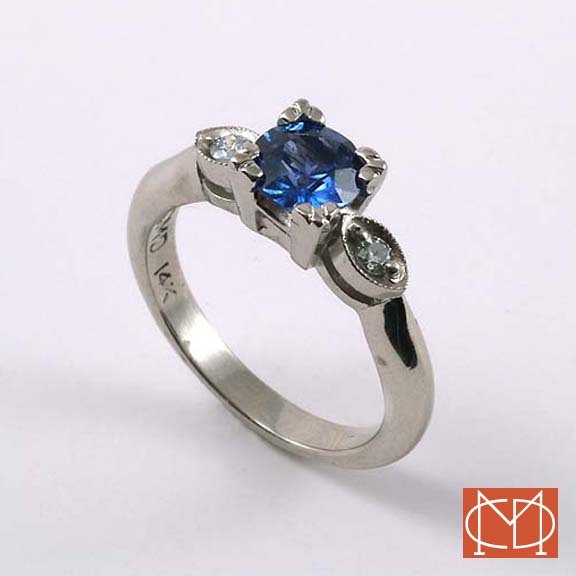 This ring is cast in 14 Karat white gold, and hosts a 1.0 carat, round bright blue AA grade sapphire with an excellent cut. This version has 2, 1.5mm natural green round diamonds set on either side of the center stone, (while they last) very rare! This ring is cast locally and we hand milligrain the edges of the side diamond settings and create the design on the top stone setting by hand. Very unusual, different and fresh.